A Thundering Disgrace No More? Three years ago this site drew attention to the scandalous condition of Aldborough House in Dublin (see A Thundering Disgrace, January 13th 2014). The last great aristocratic townhouse to be built in the capital (and, other than Leinster House, the largest) the building’s name comes from the man responsible for its construction Edward Stratford, second Earl of Aldborough. Although the earl already possessed a fine residence next to Belvedere House on Great Denmark Street, he was determined to construct a new one that would testify to his wealth and social position, in addition to serving as centre-piece to a westerly extension of the city beyond that already achieved by the Gardiners. Portland Row is a continuation of the North Circular Road, running from the Phoenix Park to the docks, and it made sense to anticipate further development in this part of Dublin. Unfortunately Lord Aldborough failed to take into account the consequences of the 1800 Act of Union (for which he voted) which led to a steep decline in the city’s fortunes and left his great town house marooned. Five years in construction, and costing over £40,000, Aldborough House was only enjoyed by its owner for a short period since he died in January 1801. The property passed to his widow who subsequently remarried but was likewise dead a mere eighteen months later. Then came a decade of litigation before Lord Aldborough’s nephew Colonel John Wingfield was confirmed in possession of the house; he promptly sold its entire contents. The building was then let to ‘Professor’ Gregor von Feinaigle, a former Cistercian monk and mnemonist, who opened a school there. (Incidentally, it is proposed that the word ‘finagle’ derives from the professor’s name and reflects his dodgy pedagogical methods). Six years later von Feinaigle died and by 1843 the house had become an army barracks. In 1850 the garden statuary was all sold and in the 1940s the garden itself was lost, used by Dublin Corporation for social housing so that today Aldborough House has effectively no grounds. As for the house itself, coming into public ownership it served as a depot for the Department of Posts and Telegraphs during the last century. During this time and especially in later decades the property was compromised by various ill-considered alterations such as the vertical divisions of rooms to create office space and the effective gutting of the former theatre. At the end of the 19th century all the chimneypieces, supposedly by Pietro Bossi, were removed and placed somewhere safe, never to be seen again. Nevertheless, the house remained in use and in reasonable condition. In 1999 the state telecommunications company Telecom Eireann was privatised as Eircom and that organisation offered Aldborough House for sale. The Irish Music Rights Organisation (IMRO) considered it for a new headquarters but then opted not to go ahead with the scheme and in 2005 the building was sold for €4.5 million to a company called Aldborough Developments and over the next nine years it fell further and further into disrepair. Today’s photographs were taken during a recent opportunity to inspect the interior of Aldborough House, and they testify to the building’s poor condition. The vast central staircase, of cantilevered Portland stone with wrought-iron balusters, is now supported by a number of metal poles rising the height of the building: the glazed dome at the top has been covered over, so no natural light reaches here. Many of the other areas are likewise boarded up, and can only be seen with the aid of a torch. The main rooms on ground and first floors are today principally striking for their scale, immense bare spaces stripped of whatever decoration they had once been given (although in the ballroom scagliola pilasters with Corinthian capitals survive beneath layers of paint). Long windows running almost the full height of the walls provide ample views of what was once largely open countryside but is now urban sprawl. Some of the overdoors, on which classical figures recline and putti frolic indifferent to the decay around them, remain but others have been pulled out. The chimneypieces, as already mentioned, are long gone, even in rooms on the attic storey. Tantalising hints of former splendour appear here and there, but in the main the impression is of long-term neglect with inevitable consequences for the building. Aldborough House changed hands once more in autumn 2014 and initially little seemed to be happening to improve the site. More recently however, clearance and stabilisation work has taken place, as well as the advent of decent security to ensure the place is no longer vulnerable to vandalism. There are proposals now being developed to give Aldborough House a viable future and if these are allowed to proceed the property would be restored and brought back to use. For too long it has sat empty and untended: anyone who cares for our architectural heritage must hope that this situation will soon change and Aldborough House no longer be a thundering disgrace. 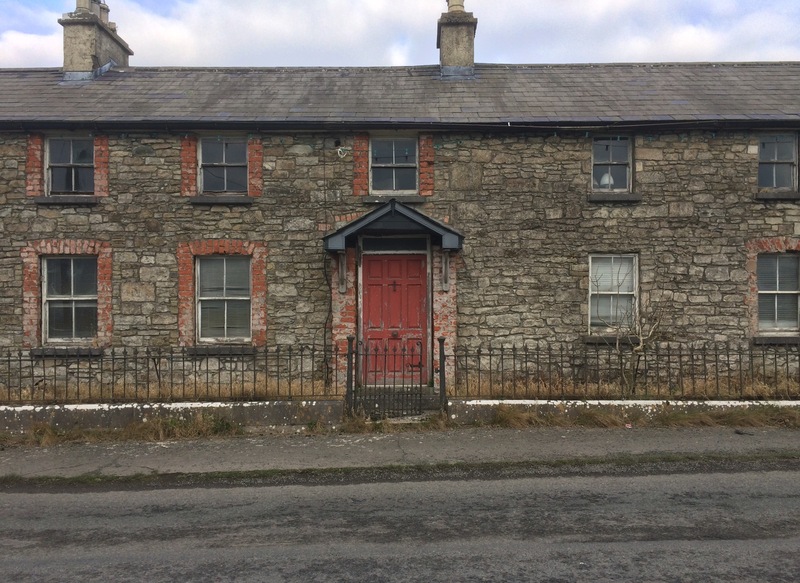 Further instances of the near-ubiquitous urban dereliction now found in Ireland: houses close to the central square of Johnstown, County Kilkenny, a town laid out in the 18th century by the Hely family who lived nearby in Foulkscourt House. The latter has since been lost, although some of the associated buildings survive. However, it looks like these little properties will not last much longer. The entrance gates to the former Rockbrook estate in County Westmeath. Dating from c.1780 the adjacent lodge has a charming concave exterior wall, pedimented and with one arched window set off-centre. The building behind is ruinous, as is the main late 18th century house formerly occupied by the Isdell family. Readers of a certain vintage may remember a long-running English soap opera called Crossroads in which notoriously the sets were as flimsy as the plots. Set in a midlands motel, the series ran for over twenty years with three or four episodes every week, an astonishing achievement considering how little real drama they ever featured. Yet for much of its history Crossroads regularly attracted audiences of up to 15 million. In 1926 the American journalist H.L. Mencken wrote, ‘No one in this world, so far as I know — and I have searched the records for years, and employed agents to help me — has ever lost money by underestimating the intelligence of the great masses of the plain people.’ The success of Crossroads demonstrates the truth of this observation. Today’s building looks as though it could have been constructed for an Irish version of Crossroads. Located in the north-west corner of County Meath, it appears to have been originally a modest farmhouse which was then much-extended to incorporate outbuildings around a central courtyard, the result being a budget hotel with twenty-seven bedrooms and sundry other spaces including a restaurant, bar and conference hall. Everything about the place seems insubstantial and gimcrack, except an enormous Baroque-style sandstone doorcase with open segmental pediment on one side of the property: can this have been salvaged from somewhere else? Is it even Irish? In any case, otherwise the fittings are of poor quality and are correspondingly today in poor condition. The hotel closed down some years ago and has since been offered for sale, with the option of alternative use as a residential nursing home. Wandering about the site, it is unclear whether or not a new owner has assumed responsibility for the building, which at present has the eerie atmosphere of a Bates Motel. Neglect has taken its toll on what was never a very robust building and the place reeks of damp and decay. Not quite as flimsy as a Crossroads set, but not much better either: testament to the transitory nature of deficient design and cheap materials. The Lloyd Mausoleum in the graveyard at Aughrim, County Roscommon: a church dating from 1744 (and described by Samuel Lewis in 1837 as ‘a neat plain building with a small spire’) stood adjacent until 1955 when it was demolished. Monuments inside the church were moved outdoors and can now be seen in plots around the mausoleum. It was erected in 1907 by Major William Lloyd following the death of his wife May and he was subsequently interred there five years later. Members of the Lloyd family had lived in nearby Rockville House since 1740 but sold the estate in 1918; after passing through several hands, the house was demolished in the 1950s. One of what might be termed Ireland’s pocket cathedrals: that dedicated to St Feidhlimidh at Kilmore, County Cavan. The present building was designed by London-based architect William Slater who received a number of such commissions in this country. Consecrated in 1860, it replaced an older and much altered structure which by the mid-19th century was deemed unworthy of purpose and therefore almost entirely cleared away. The only surviving trace of its predecessor is a much-weathered Romanesque doorway set into the north wall of the chancel, although it has been proposed that this feature originally belonged to another church, that of the Premonstratensian Priory of Holy Trinity of nearby Lough Oughter (although this was founded about a century after the doorway was likely carved). The cathedral is one of a group of buildings on this site that also includes the now-empty early 19th century Bishop’s Palace, or See House (for more on this read See and Believe, September 14th 2015) and one section of a much older palace. The see’s most famous incumbent was William Bedell who as Bishop of Kilmore and Ardagh was responsible for commissioning the first Irish translation of the Old Testament. The upper section of the double-height stair hall in 7 Henrietta Street, Dublin. The house dates from the early 1740s and retains some of its original interior, albeit in a much mutilated condition. For example, as can be seen below with a handful of exceptions the carved balusters were removed over a century ago when the building was divided into tenements and replaced with coarse timber uprights. But the walls retain their plaster panelling, a battered recollection of how splendid this space must once have been. What still stands of Duleek House, County Meath. The limestone-fronted façade of the building was added c.1750 to a residence probably half a century older, as can be seen by a side-view below. If not designed by Richard Castle the front section was certainly much influenced by him, and the tripartite doorcase is very similar to that of the last surviving 18th century house on Dublin’s O’Connell Street (no. 42). The interior featured an entrance hall with three arched openings to the rear providing access to the staircase and reception rooms with neo-classical plasterwork. When surveyed for the National Inventory of Architectural Heritage, Duleek House was still intact and occupied. Since then it has deteriorated into the present dangerous condition and appears unlikely to survive much longer. The building is of course listed for protection. It is easy to miss Roscommon Castle: despite the building’s immensity, it scarcely seems to impinge on the horizon. Such was obviously not the case when the castle was first constructed, since there would have been nothing of similar scale anywhere in the area. Work was initiated here in 1269 on the instructions of the Anglo-Norman knight Roger de Ufford, who served as Justiciar, or chief governor, of Ireland for Henry III. There were constant setbacks due to attacks on the site by Aedh O’Conor, King of Connacht; it appears the greater part of the castle was erected only in the years following his death in 1274. Originally much of this area was a lake, Lough Nea, and the castle stood on raised ground to the immediate south-east, surrounded by a moat fed by the lake’s waters. A stone wall stood immediately inside this ditch but the main structure was set further back and featured substantial three-storey D-shaped towers at each corner. The main entrance on the eastern side was flanked by three-storey gate houses, and there was a secondary point of access on the western front. Despite impressive fortifications, Roscommon Castle continued to be subject to attack from the native population and by the mid-14th century had passed into the hands of the O’Conors who remained in occupancy there for the next two hundred years. In 1569 the then-O’Conor Don Diarmaid mac Cairbre surrendered Roscommon Castle to Sir Henry Sidney, Lord Deputy of Ireland. Eight years later the building and 17,000 acres were granted by the English government to Sir Nicholas Malby, who was Governor (later Lord President) of Connacht. Malby fundamentally altered the appearance of the castle by transforming it into a Renaissance fortified mansion. The northern side, which had never been of stone, was made into a three-storey domestic dwelling linked to the eastern range to form an L-shaped block: large stone mullion windows were inserted into the upper floors of the latter to admit more light than had hitherto been the case. Within the outer walls a new garden was created. On the northern side, for example, the ditch was turned into a long fish pond while formal geometric parterres were planted to the east and a grand tree-lined avenue to the south. None of these features survive.